Hello there loves! Hope you're all doing fine :D I'm excited to make this review because after two weeks of using religiously, I can attest to its effectiveness in combating those painful reddish pimple and dark spots or pimple marks. This is my first spot treatment to date since I just let a pimple or two subside by itself before. I have this bad habit of pricking those nasty zits on my cheeks and chin where they always pop out if the size is still the same after a week. I'm glad that after so many years of just letting pimples to come out of my face before and after my monthly period already found a solution. Thanks to Celeteque DermoScience for bringing this product line. Although I haven't tried the Acne Solutions line, I'm sure they will give good results if used consistently. I suffered from acne breakouts last month and I'm considering two spot corrector that time. 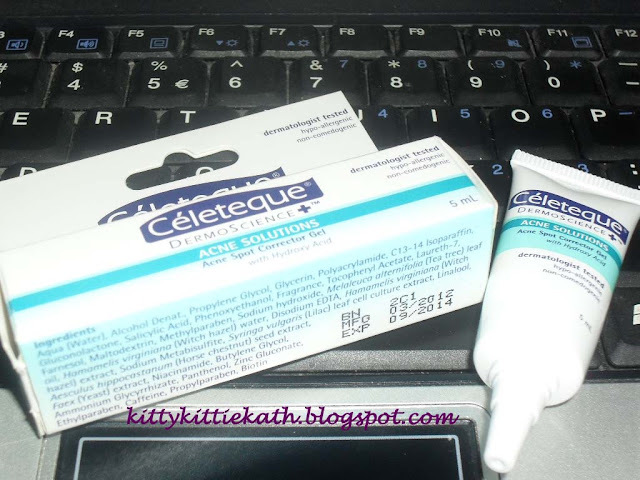 Since Celeteque is a trusted brand when it comes to skin care that's dermatologist-tested and hypoallergenic, I gave it a try and satisfied with the results. I bought this Celeteque Acne Spot Correcting Gel three weeks ago and applied on existing cystic acne and new ones. Patience is a virtue, I'm not expecting this to make my pimple disappear overnight but in some cases or depending the size it can make a big difference on the size of a pimple after 12 hours. My son accidentally deleted the photo of my angry pimps that I wanted to show you- bummer! But I swear this product works!!! Now here's my take on Acne spot corrector gel, click read more to see my full review. ~Uses beta hydroxy acid (BHA) combined with poly hydroxy acid (PHA), which aids in exfoliating dead skin cells and helps in diminishing pimples and other acne imperfections to achieve clear smooth skin. ~Contains Lilac leaf cell culture extract that helps reduce sebum production to prevent future acne breakouts. ~Has a biotechnological complex that acts as a natural astringent and sebum control. ~There is significant acne reduction by as much as 80% in just one day. instructions for use: After cleansing your skin, apply a thin layer on affected areas morning and night. Comes in a handy tube that fits in my palm. I can control the amount of product coming out of this nozzle type of tube. Has a medicinal smell but tolerable. There's a bit of stinging upon application, an indication that the product is working on the affected area. Doesn't burn or peel the site where I applied it. Reduced the size of my pimple after 12 hours and gone after 2-3 days. Has batch, manufacturing and expiry date stamped on the box and the tube. Sometimes it's out of stock. Do you use spot corrector treatment for your pimple? Any Celeteque users out there? I want to try this also, but can I use this after moisturizer? haven't tried using an acne spot corrector... but I'm a celeteque user :) Cheers! Not bad ang 169 a. Hope I remember this when I'm out of benzoyl peroxide. @Ms. Kath I'm using the Hydration Facial Wash and Moisturizer for almost a year now... it's working great.. haven't had any major skin breakouts :) although i still have problems with blackheads/whiteheads on the nose area! do you have any suggestions? @Hazel- :D let me know how you find it. @Rae- yup, matipid din gamitin kaya sulit yung 169. @Andy- oh i see, it's nice to know na hiyang ka sa products nila. About the blackheads/whiteheads thingy IMO mahirap iwasan specially if lagi ka naka-makeup everyday. So better use non-comedogenic products talaga. saka wash your face regularly para di ma trap yung dirt sa face. Ako kahit bihira lumabas may black and white heads pa din. Di ko din maiwasan. I just use toners like yung All organics. Kasi sa nose area naman ako madami nun so hindi ko na lang masyado pinapansin. Thanks for the review. Haven't tried this product. hi kath. its my first time to use the acne spot corrector gel. effective ba tlga? kasi depress nako sa mga pimples ko. sobra dami tas dami rin dark spots. meron ako gnagamit na soap after putting tha gel. defensil yung brand nag da-dry din sa face tapos yung gel. sana effective to. Nice review. I will try this product. Anyway I just want to say I like your blog. There's a lot going on. I am a blogger also. Keep it up. Hi there. I was using 4 products of celeteque and some pimples are coming out and I using this about more than 3 weeks. So far so bad. Should I stop using this and go to the dermatologist? I using celeteque more than 3 weeks and as far as it goes, some pimples are coming out. Do you think I should stop using this product? @Anonymous- since you're using the products for more than 3 weeks now and nothing good happened, it's better to consult a dermatologist so he/she can assess your skin condition. Thank you for letting us know that this product doesn't agree with your skin. good thing I stopped by your blog. 1/2 weeks of healing process using this product is not bad ha. ill definitely try this. I have been using this azelaic cream provided by my derma is not really effective which I paid for 500php. very frustrating. What a pain. Acne. I hate it. I feel very sad when I look at my picture. I've had acne for more than four years now. I have treated under skin pimple for a long time, but I don't see any difference. I'm hoping that one day, I will be free from it. @Anonymous- Yup, this product is effective and intense on small bumps and pimples just be patient applying and you'll see a difference. @Amelia- Aside from what you've said, acne can also lower once self-esteem. I know this can be very frustrating for others but with proper skin care treatment this can be prevented and healed. Patience is always the key. 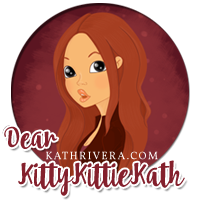 oh our nickanames wre almost the same... "Kitty-KATHY-KATE.."
my clasm8 recommended celeteque SUNCARE moisturizer, at binili ko naman.. nung nakita ko ang blog mo, natuwa ako kasi celeteque rin yong ginamit mo. 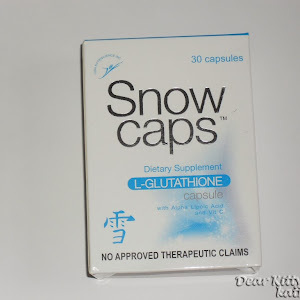 effective nga itong acne spot corrector gel. 3 days after nakita ko ang pagka-iba ng mga alaga ko haha.. thank you talaga dito... uhm, yong mga spots gawa ng pimples, mawawala nga po ba talaga nito? and how many days pa kaya? :). @Anonymous- Hello there. I highly recommend Virginia Olsen Minerals for mineral makeup. It's affordable and very suitable for sensitive skin. They have the greentea line which is good in keeping oilies at bay. 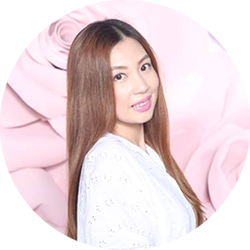 If you want liquid foundation and other kinds of makeup for sensitive skin check Snoe Beauty. thanks for that info kath,. one more thing is that available in watsons too? im a celeteque user more than 1 month na rin. i use facial wash, toner and moisturizer. in 2 weeks of using these products, i saw the improvements in ,my face. problema ko n lng ang dark spots ko. i need your suggestion. thanks! @Anonymous- That's good to hear na ok sayo yung celeteque. About the dark spots, medyo matagal lang talaga mag lighten but what I'm using is QUICK FX pimple eraser. Meron din yung celeteque na dark spot corrector but haven't tried it pa. Try q rin bumili nito,saan ba pwedeng bilhin yan.baka kasi wla yan dito sa amin,medyo malayo kasi ang mall.you think availlable yan sa mga hindi sikat na pharmacy? May night cream po ba kayong alam na ma-isuggest sakin? 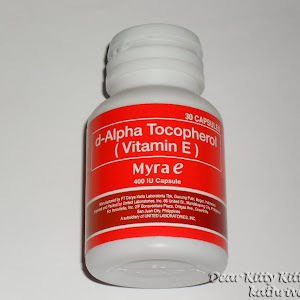 @Jessa Timbal- I know this product is available sa mga Beauty and Health section ng department stores. Watsons lagi meron stock nito. Not sure sa hindi sikat na pharmacy. @Anonymous- Hi, this product is for pimples and pimple marks but not for acne scars. You can try contractubex for that. 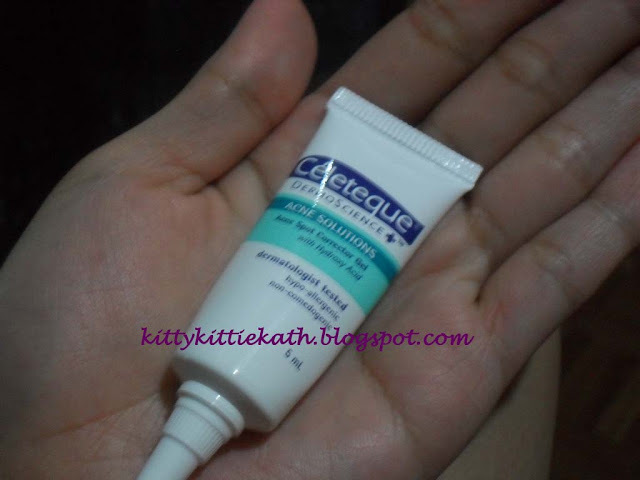 @Cj Escuadro- Hello dear, yup this is one of Celeteque's worth the price product. @Sannydrops- tried blemish patches na din before pero same tayo it's not effective din for me. Thank you for the review i will recommend this to one of my friend.As i read,its very effective. Can i use celeteque acne spot corrector gel and quick fx pimple eraser at the same time? Thanks again for the review. Ill recommend this to my friend. @Anonymous- yup. apply the gel first then after 5 minutes Quick FX naman. the dilemma of every woman to experience acne, i havent tried this product. @magzdc- yup,and we always look for the best solution to this problem. Id recommend this for my sister, I hope it will help her since she has acne after her pregnancy. @Mary Ann Cueto- yes, recommend this to her. I know the feeling na madaming pimples after giving birth. lalo nakakadagdag sa post partum depression. I need this. :D haha. thanks! where can i get or buy this?is it available in South African pharmacies? 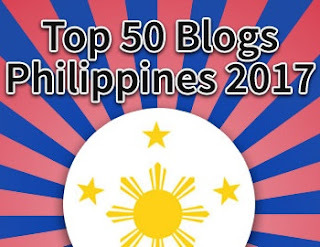 @Rhea Juaton- Yay,hope this will work for you! @Anonymous- hello there, I'm afraid it's not available there. I have no idea if it's available at South African pharmacies. My apologies. @Anonymous- hello there, haven't tried a cream for oily skin but if you're looking for one try water-based creams because it's light on oily skin individuals. i'd definitely try this one out coz i've always have breakouts un my chin and sometimes it's huge i'm ashamed to go out. 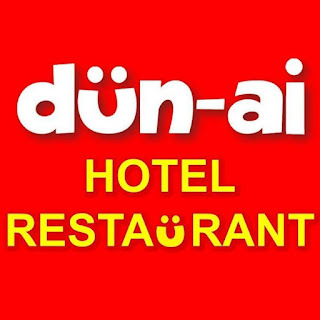 @yenmorales- try this, I highly recommend it. Celeteque is my current fave, but never ko pa natry this acne spot corrector., i use celeteque toner, moisturizer and facial wash.
@Leilani Gamboa- wow! you should try this too kasi hiyang ka naman sa iba nilang products :) Good for you sis! @Anonymous- hello, this product is used to flatten or stop pimples from worsening. I suggest after trying this use another cream or ointment good for dark marks left by pimples. @helen gatbonton- great! thanks for sharing your experience. @leizle demaisip- aww, too bad hindi nagwork sayo yung product na yun. hope this one will be effective ones you use this na. 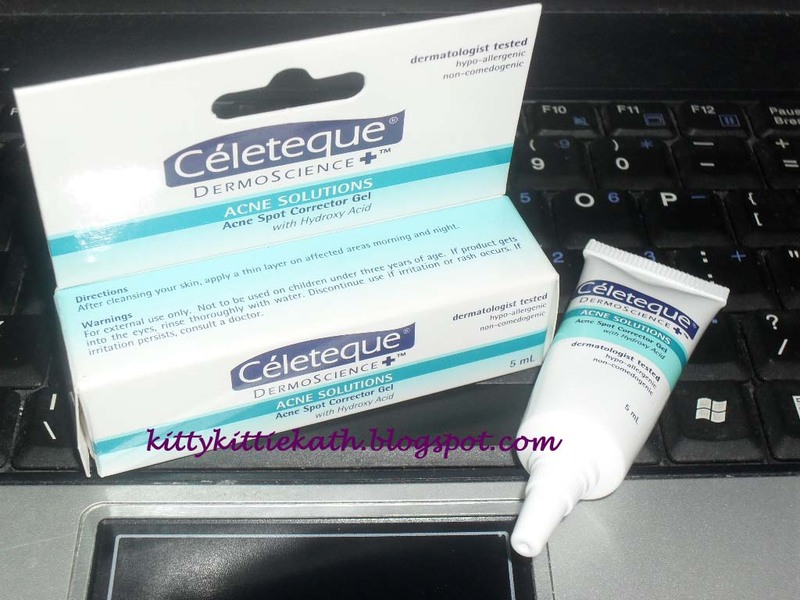 i trust this brand Celeteque because i always use this everynight to remove my pimples and dark spots. 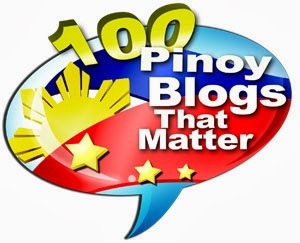 @aiko borja- thank you for sharing your experience sis ha. oo nga e, magandang proof pa naman yun. anyhoo, I always here that toothpaste trick pero never ko pa na try. @Liezel Salem- thanks for sharing dear. Yup, Celeteque is one of the most trusted brand when it comes to skin care. I love this product! I use this now, I still have acne issues every now and then. And celeteque is a good brand, I like their facial wash too. Yay! Thank you so much for sharing your experience. I'm on my third tube na of this product. Very useful every time a new pimple is going to pop up. Hi this gel is not for ligthening or whitening of dark marks. It only tame or prevents pimples from developing. Or if you have existing pimples it will heal it faster. About the the dark marks, celeteque also have a corrector for that but I haven't tried it yet. For dark marks, try using iWhite Korea whitening face cream. But if it's stubborn, you need to buy a concentrated dark mark corrector. You can also opt for diamond peel but it's expensive coz you need more than 5 session to see the results. looks like this will work for me .. I want to try this because i have acne problem hope it works for me. Contractubex po yung ginamit ko na effective. Hello, I'm not sure about that kasi haven't tried the product yet. Sana you asked the Sales Assistant first on what the product can do to your skin. I don't have any idea about that variant kasi. Yes try it and let me know. It's depends on the usage. Ako kasi more than a month hindi ko naman kasi lagi ginagamit. Just to be sure, you need to consult a dermatologist kasi very sensitive pa ang skin ng mga bata. Magkano naman po yung celeteque correction spot? I tried it before, but sadly it didn't work for me. I guess I was just too impatient and wanted to get results quickly. I might as well try this again and this time, I'll try it for 2 weeks or so. Nice to discover new products and brand via your reviews! Although not a product of my country Brazil seems to be a great product! I think its a great product. Good to hear it works for you..
Pwede ba gumamit ng celeteque acne spot gel ang 17years old palang ? Dami kase ko pimple at mga malilit na kung ano sa mukha ko? 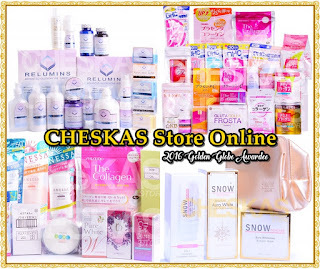 Gsto kona kase matanggal lahat ito e.
Hi kath, do you think ang celeteque applicable din sa guys? Been having some problems with pimples for 3 years now. I tried so many products but it never worked. I'm a bit optimistic with this product since maganda ang review niyo dito. So do you know any guys na gumamit din ng celeteque gel na eventually nawala ang mga pimples completely, i'm not concern about the marks or dark spots as long as mawala lahat ng malalaking bulalakaw ko sa mukha. Thanks and hoping for your soonest reply. Thanks pala sa review. This is for pimples only. not for acne scar. Any suggestion for acne scar? 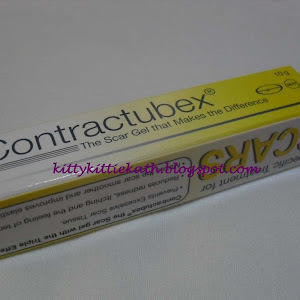 Try contractubex basta hindi pa 2 years older and scar. Hi mam! Nice review. Pwede po ba maglagay pa ng other prosuct after applying correcting gel? Effective pa po kaya yun kahit natapalan na ng powder or foundation yunv face po? Yes, just wait for the gel to be absorbed bago ka maglagay ng ibang product. Pero ako kasi sa gabi ako nglalagay or kung nasa bahay lang ako. Thank you! Medyo lumalaki po ang zits ko, pag gumaling na after few days babalik po ulit sa parehong place din. What should i do? It depends. Kung hindi pa totally napatay yung bacteria pwede. If na irritate ulit sya pede. Kaya yung Celeteque not only pimple gel yung dapat na gamtin if acne prone skin. They have toner, facial wash, and moisturizer din para may maintenance. Both are for pimples naman. Choose lang muna which one ang mas prefer mo gamitin. No, para ito sa pimples, cyctic acne, and acne po. I'm glad to hear that it's effective on zits. For acne marks, whitening creams will do like Belo Kojic and Tranexamic Acid or Lily's Touch Miracle Cream. Good day! Ask ko lang if may chance mawala yung acne marks sa face? Thanks in advance! This not for acne marks na deep. It can dry and lighten the pimple marks lang. Can i ask if this product remove the pimple marks ? This is for drying up pimples and not to lighten the marks.